...........than to have never hooked at all. The grab was nothing out of the ordinary. Good solid pull followed by a squealing Hardy. A couple short runs then the fish came straight at me. I reeled to keep tension on the line as the fish moves upstream. "its a big buck" my buddy said to me as we both kind of recognized by the fishes behavior it was probably a boy. I still had not felt the full weight of the fish as it had been a highly erratic fight so far. As the fish moved upstream I put the wood to it and tried to roll him over or change his course. Not happening. My 7wt was bent to the cork and I was pulling as hard as I dared with 12 lb test. That's pretty hard. The fish was not phased in the least and just kind of did what he wanted. Another good line ripping run downstream and then more of the same. As I reeled and pulled, he just sort of swam and meandered his way back upstream. He got even with me and then went around a mid river shelf and sulked on the other side. The line was over or under or around the shelf in such a way that I lost connection with the fish. I know he's still there but can't get an angle on the line or the fish with the current and structure hampering my efforts. My wise buddy says " Get downstream of him and pull him off backwards" This seemed counter-intuitive to me as it looked like the line was around the front of the rock and the current was keeping it down. The fish was on the far side. But, I was ready to try anything at this point so I slowly walked downstream, getting below the fish a ways and pulling the whole time. Finally, as I got below him I could again feel the throbs of a heavy fish still on the line but still around the rock somehow. I moved a little farther down and the fish came to life, surging and thrashing at the surface, throwing his massive body side to side and raising a ruckus. Still around the rock I staggered through the rocks reeling and pulling hoping to free the fish from its predicament. I stumbled and fell in, putting an arm down and feel the cold North Umpqua water pouring in by the buckets. I wobble to my feet colder and wetter. The fish makes one last thrash on the surface and saws the line off and we part ways. 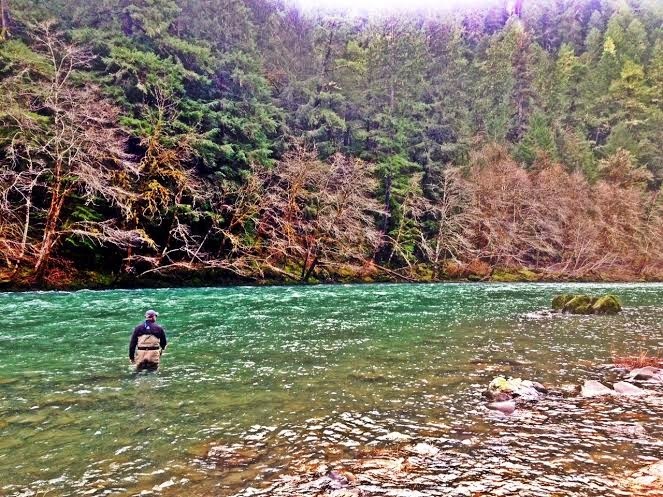 We both see the massive body and tail of a wild winter steelhead bolting for its new found freedom and he is gone. The chances at these truly huge fish are fleeting. To get them to eat a swinging fly is one thing, to land them is another altogether and always a gamble. Everything must go perfectly and gear and knots must be perfect. That may easily have been the biggest fish I will see this year, maybe for years. I was privileged to encounter it and feel blessed to be near and know a river where these fish swim. Proverbs 21:13 The horse is made ready for the day of battle, but the victory belongs to the LORD. Great story Mark! Sounded like a fish of a lifetime. Thanks for the scriptures!